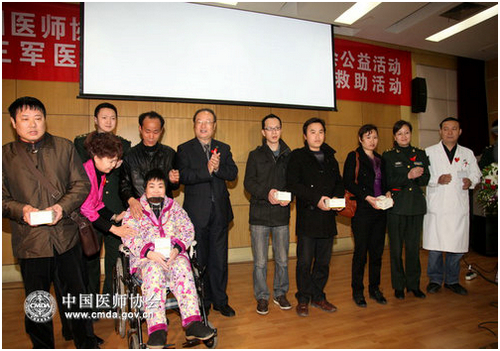 A medicine donation ceremony was held for the social event of “Warming Up the Frozen Heart” at the Conference Hall of the Southwest Hospital, China. 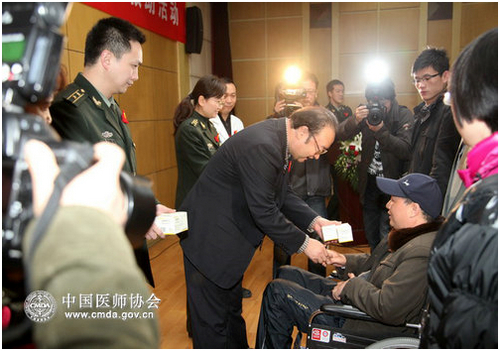 RMB7200 medication was donated by CMDA to 27 ALS patients. Over 100 people attended the ceremony, including Dr. Cai Zhongjun, Vice Chairman of CMDA, Mr. Yuan Yaming, Administrative Director of CMDA, Dr. Guo Jiwei, Vice President of the Southwest Hospital, medical doctors, ALS patients and their families, and the media. Dr. Cai made a heart-marming speech “Giving Hopes to ALS Patients” and encouraged them to continue their efforts in fighting the disease. Vice President Guo’s speech focused on the specialized ALS clinic of the Southwest Hospital, the only designated hospital in the Chongqing Region to provide ALS medical services in this social event. The Hospital provides free visitations, examinations and medicine to ALS patients every three months. Under the sponsorship of CMDA, over 3000 ALS patients have been registered and its phone hotline has received over 50,000 inquiries. Over 1200 ALS patients under the poverty line have received donations. A national committee was founded in 2010 to develop a service network across the country, including free medication, breathing equipment supply, computerized monitoring system, a home-based service plan and a volunteer plan. Mr. Da-Kui Yin and local government officers visited E-Mei-Shan City People’s Hospital, , , Le-Shan Woman and , Ma-Bian County People’s Hospital, . Meeting with local practicing physicians, Mr. Yin praised their professionalism and accomplishments.February 12 to 15, 2007, accompanied by colleagues of CMDA rural healthcare improvement project, former Vice-Minister if China Ministry of Health (MOH), CMDA president Ka-Kui Yin assessed the project progress at E-Mei-Shan City, Le-Shan City and Ma-Bian County of Si-Chuang Province and donated 200 sets of Stethoscope, 200 sets of blood pressure testing device, and one million Yuan worth of medicines.